The OIF announced today the publication of the “Common Electrical (I/O) CEI 4.0” with a focus on Serdes standards for 56 Gbps. This is the first completion of Serdes standards for the CEI generation of 56 Gbps I/O devices and adds PAM-4 and Ensemble NRZ as additional advanced modulation schemes to NRZ. Preliminary testing of 56 Gbps work has also been demonstrated by OIF members for the past two years at OFC where chip designers, connector vendors and test equipment suppliers showed the viability of the electrical channel parameters. CEI 4.0 represents the eighth generation of OIF electrical interfaces over an 18-year span. The CEI 4.0 can be found here. Further clauses with additional modulation variants of the above reaches will be added in a future CEI 4.1 release. The Optical Internetworking Forum (OIF) announced that it has begun work on long reach (LR) and medium reach (MR) CEI-112G, building upon two existing 100G serial electrical link projects. Forum members continue to support and approve the development of projects addressing CEI-112G as bandwidth needs increase. Dr. Chongjin Xie of Alibaba was invited to present to members at the quarterly meeting in Shanghai. Dr. Xie shared with members the need for various network technologies, innovations and breakthroughs for datacenters. Following the meeting, the members participated in an OIF Day with China Unicom and SK Telecom. The CEI-112G-LR project defines an interface to enable high-loss 112G backplane channels. This project will also facilitate direct attach copper (DAC) cable channel links at 112G. The CEI-112G-MR project will develop specifications for a chip-to-chip (c2c) interface which can also be used to support applications of 112Gx2 (224G), and 112Gx4 (448G) with reduced power, complexity, and enhanced density. Members voted to evolve the Carrier Working Group into the new Network Operator Working Group, reflecting the active participation of web-scale and content service provider members such as Alibaba, Google and Microsoft, along with traditional service providers such as China Telecom, Orange, TELUS, and Verizon. Cathy Liu of Broadcom Limited and Dr. Martin Bouda of Fujitsu were newly elected to the Board for one-year terms, with Dr. Bouda appointed to secretary/treasurer. Ian Betty of Ciena was re-elected for a two-year term, and Tad Hofmeister of Google was elected to a two-year term. Jonathan Sadler of Coriant was appointed to vice president. Dave Brown of Nokia continues to serve as president, and Nathan Tracy of TE Connectivity continues to serve as vice president of marketing. The Optical Internetworking Forum held their fourth quarter meeting this month in Auckland, New Zealand, resulting in several new project starts and board elections. The OIF also held an interactive educational workshop with Spark New Zealand, a New Zealand-wide communications service provider. This new project will develop an implementation agreement for 400G ZR and short-reach DWDM multi-vendor interoperability. It is relevant for router-to-router interconnect use cases and is targeted at (passive) single channel and amplified DWDM applications with distances up to 120 km. This project should ensure a cost-effective and long-term relevant implementation using single-carrier 400G, coherent detection and advanced DSP/FEC algorithms. The project will define the ACO electrical I/O independent of the choice of form factor and optical carrier count for 45 Gbaud and 64 Gbaud per-carrier applications. This project would build upon the success of the CFP2-ACO but is form factor agnostic so that it could be applied to multiple applications such as CFP4, CFP8, QSFP, micro QSFP and OFSP. Members have requested that the industry combine the coherent modem management interface specifications [4″x5″ LH MSA, CFP2-ACO, CFP2-DCO, Flex-Coherent, etc.] into a standalone document. OIF leadership, working in conjunction with the CFP MSA group, is inviting companies to participate in creating a complementary Normative document. This project will define a small form factor component implementation agreement that combines the high baud-rate PMQ (HB-PMQ) modulator plus the RF drive functions into a single component. This new component will be used in conjunction with a high baud Integrated Coherent Receiver (ICR), a micro Integrable Tunable Laser Assembly (ITLA) and a coherent DSP, to implement a high performance coherent modem. The OIF continues to leverage the unique OIF Day program platform to reach out to key industry players for technical and strategic input. In conjunction with the Forum’s recent quarterly meeting in Auckland, the OIF hosted a half-day interactive and educational workshop featuring OIF and Spark New Zealand subject matter experts. The event achieved the objectives of introducing OIF work projects to this local service provider and obtaining valuable input on regional business and technical network challenges. Dave Brown of Nokia was re-elected to the Board for a two-year term and appointed as president. Re-elected to one-year terms were Junjie Li of China Telecom and Dave Stauffer of Kandou Bus. Stauffer will continue to serve as secretary/treasurer. Jonathan Sadler of Coriant and Nathan Tracy of TE Connectivity were elected to the board for two-year terms. Tracy was appointed as vice president of marketing. Tom Issenhuth of Microsoft was appointed as vice president and Ian Betty of Ciena continues to serve on the Board. Newly elected were Klaus-Holger Otto of Nokia as Technical Committee chair, Ed Frlan of Semtech as Technical Committee vice chair and Jeffery Maki of Juniper Networks as chair of Physical Layer User Group Working Group. Brian Holden of Kandou Bus, Market Awareness and Education Committee co-chair, Physical and Link Layer; and Lyndon Ong of Ciena, MA&E Committee co-chair, Networking were both re-elected. Optical Internetworking Forum (OIF) members recently approved important updates to the Micro Intradyne Coherent Receiver implementation agreement. The IA introduces three classes of receivers, distinguished by their RF frequency response, to support Flex Coherent DWDM transmission to 400G and beyond. The OIF continues its efforts to look beyond 100G by selecting a 400G implementation technology option. The newly published Flex Coherent DWDM Transmission framework document specifies a single technical approach for diverse network applications, including long-haul (LH), metro and data center inter-connection (DCI). One of the objectives of this work is to provide direction on the technical developments required by system and component providers. “Our system vendor members continue to flow down future system requirements so that component suppliers can be ready with products to support their designs,” said Karl Gass of Qorvo and the OIF’s Physical and Link Layer Working Group – Optical Vice Chair. The OIF is planning its next global transport SDN Interop demo. 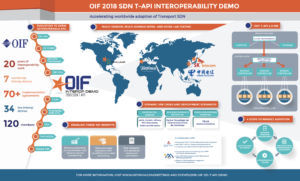 Building on the successful OIF 2016 Global SDN Transport API Interoperability Demo, the goal is to show APIs at work in key commercial transport SDN use cases. The OIF is seeking input from the service provider community, including those that have not participated in past interop demonstrations. Click here to complete the anonymous survey by September 8, 2017 and help shape the next interop demo. Klaus-Holger Otto of Nokia – Technical Committee, Chair; Ed Frlan of Semtech – Technical Committee, Vice Chair; Lyndon Ong of Ciena – MA&E Committee Co-Chair, Networking; Brian Holden of Kandou Bus – MA&E Committee Co-Chair, Physical & Link Layer. This event will be an interactive and educational workshop featuring OIF and Telefonica subject matter experts including Juan Pedro Fernandez Palacios, Head of “Core Network Evolution” for Telefonica. Topics will include OIF projects and directions, SDN for transport optical networks, and interoperability in disaggregated networks. With this exclusive event, the OIF is directly reaching out to understand service provider challenges and strategies, unlike any other forum. This event is open to all OIF Principal members and Telefonica.